What Does All This Blockchain Hype Have to Do with Localization? Some call it “the truth machine.” Others prefer “the Web 3.0.” But when we hear “blockchain,” most of us think of Bitcoin, for which the technology was originally invented in 2008. What many people don’t realize is that cryptocurrency is only one of blockchain’s applications. Other industries are finding exciting new ways to put the technology to work. And at this year’s TAUS Annual Conference, we learned that language services might not be far behind. Fair warning: blockchain is still considered an embryonic technology with no clear long-term effects. We can only speculate about the benefits to localization at this point. But don’t worry—you only need a basic grasp of blockchain to understand its potential. We can break that down with an even simpler analogy: Google Docs. Picture the traditional way of sharing documents. Once you send a Word doc to someone for review, you’re essentially locked out of editing it until the reviewer sends it back. You can’t see what’s happening. You might lose track of versions. Google Docs saved the day, of course, by allowing all parties simultaneous access to the same document and its complete version history. A blockchain (there are different types for different applications) works in a similar way: as a shared and continually synced database (or ledger). And this database isn’t stored or controlled in any single location. 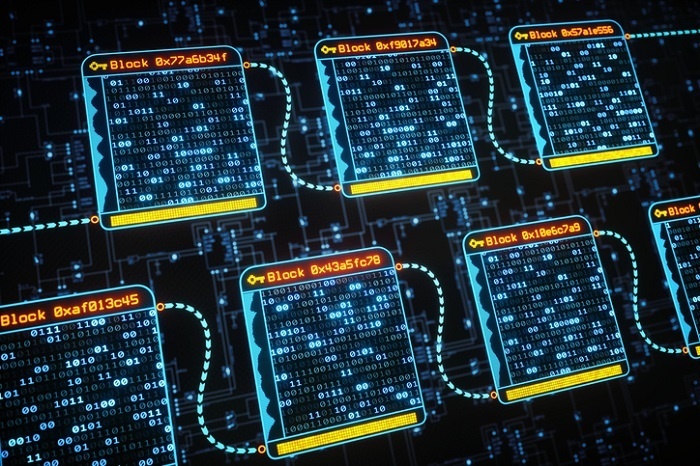 Instead, the data (arranged in groups of information or transactions called “blocks”) is hosted on a decentralized network, accessible from the computer of anyone who owns a block. You need a private, cryptographically created key to access your blocks. A hacker would need an awful lot of computing power to override every single copy. In theory, it’s possible, but in practice, it’s unlikely. In other words, your data can be stored and shared securely. What does this have to do with translation and localization? As the internet exists today, any user can copy and illegally distribute any digital asset, which has raised IP chaos for content creators. But in a blockchain—where information is timestamped, irremovable and checked on a regular basis—we can keep and prove ownership records of the digital assets we create. That includes translations. McKinsey & Company has identified six categories of blockchain applications that address three major needs: eliminating identity fraud, recordkeeping (the storage of static information) and transactions (the registry of tradeable information). Using this full spectrum of potential, the language services industry could solve at least four of its long-standing challenges. Since many LSPs outsource translations to several specialized vendors—and over time, Translation Memories might recycle those translations countless times—there is no way of identifying the original translator(s). By embedding translations in the blockchain, we can assign title rights to their creators and permanently record their work. This ability to trace translators’ histories means we not only give credit where it’s due, but can fairly compensate linguists for future use of digital assets they translate (and record in the blockchain). Tools like Exfluency already exist for this purpose. Under the industry’s current quality assurance model, quality is in the eye of the beholder and largely determined by consensus. Language service buyers have difficulty determining what “quality” means or finding the root cause of quality issues. This is another area where blockchain’s traceability can help: because we can see who localized what and when, clients can identify exactly where hiccups occur and what resources they need to fix the problem. In regulated industries like pharma and legal, current processes for tracking changes and authorizing translations are complex, insecure and antiquated. One replacement for Word documents? Blockchain-powered smart contracts. Of course, the conditions of these contracts might be based on real-world data outside the blockchain, such as from governing bodies. In this context, blockchain uses agents known as oracles to find and validate data, ensuring the integrity of the content’s audit trail. This same mechanism can be carried over to translated versions, too. Another area where smart contracts could play a key role is in supply chain interaction. As a distributed ledger (“distributed” meaning spread across multiple sites), blockchain technology could remove much of the complexity in the way translation and localization projects are assigned, delivered, accepted and paid for. The decentralized and automated nature of blockchain means you can exchange, authorize and track supply (as you would information in a Google Doc) much more efficiently. Could blockchain change the language industry for good? Not a year goes by without discussion on how to take localization to the next level. Now that the buzz over NMT has calmed down, blockchain seems to be the new thing. But the technology still raises questions. For one, is it really more efficient than traditional, centralized databases? Experts have noted that blockchain takes up far more energy, processing power and storage. Overall, industry thought leaders are conflicted on whether blockchain will be truly disruptive. It’s still too soon to say without tried-and-tested cases. But some think the industry will see far-reaching blockchain use within the next three to four years. It all depends on how ready we are, as a community, to embrace blockchain as more than a digital currency infrastructure.